The idea of a Colorado Sports Hall of Fame was first presented to the Greater Chamber of Commerce Board of Directors in 1960 as an outgrowth of discussions within the Chamber’s Metro Sports Committee. When the Board expressed interest in the concept, a Sports Hall of Fame Committee was formed to draft bylaws and to develop the appropriate organizational structure. The committee included many future Hall of Fame notables, including its first President, Roger Dougherty and future inductee Byron White. Sports media figures including Chet Nelson, Starr Yelland, Fred Leo and many others assisted the Committee in its deliberations. With bylaws in place, the Chamber Board voted in July 1964, and the necessary resources to incorporate the Colorado Sports Hall of Fame were put into place. Incorporation formally took place through Byron White’s law firm on November 4, 1964. A selection committee comprised of members of both print and electronic media from throughout the State was established to prepare procedures and criterion for induction into the Sports Hall of Fame. The first class was inducted in April of 1965. This independent selection process continues today. After nearly 35 years of honoring Colorado sports legends, the idea of a permanent museum started to gain ground in 1998, when the Metropolitan Football Stadium District approached the Colorado Sports Hall of Fame Board of Directors about their interest in establishing a “brick ‘n’ mortar” Museum in the proposed new Denver Broncos football stadium. Following the successful stadium election in November of 1998, the Colorado Sports Hall of Fame Board of Directors went to work to build the necessary community-wide relationships the launch The Museum project. As a true community asset, the Colorado Sports Hall of Fame Museum partnered with local academic institutions to involve students in the project. Graduate students at the University of Denver Daniels College of Business wrote a business plan, while students at the University of Colorado at Denver Graduate School of Architecture prepared The Museum’s design concepts and necessary construction documents. In addition, students from the University of Colorado at Denver’s Public History and Preservation program helped develop The Museum’s initial exhibits. Because of generous financial support, both in terms of capital and in-kind contributions, the Colorado Sports Hall of Fame Museum opened in August of 2001, and strives to preserve the legendary stories that make sports an important part of our social fabric. Each year, our State’s finest athletes, coaches and sports industry leaders are inducted into the Colorado Sports Hall of Fame. From world-famous to little-known athletes in sports ranging from football to track and field to fencing, these individuals have demonstrated those characteristics that are the true glory of athletic competition: sportsmanship, leadership, courage, sacrifice, endurance, and power. 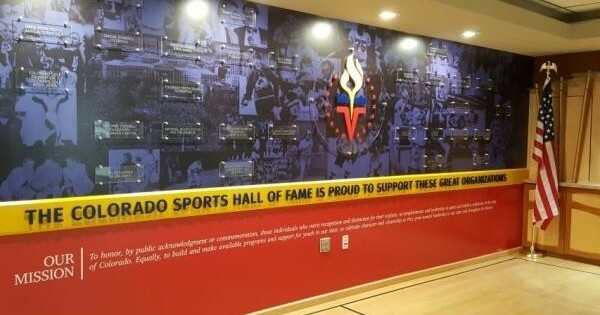 Until 2001, the Colorado Sports Hall of Fame had not had a physical home and our proud legacy of sports achievement has rarely been accessible to Colorado’s sports fans. The Colorado Sports Hall of Fame Museum, now located on the west side of Sports Authority Field at Mile High, takes visitors on a journey through Colorado sports history. Located next to one of the primary entrances, the Colorado Sports Hall of Fame Museum provides year-round access to Sports Authority Field at Mile High. An interactive exhibit for kids of all ages. Dress up in jerseys and equipment from various teams and sports.